Juggling a hectic work, home and social life often means that, while we strive for a good healthy, balanced diet every day, it may not always be achievable. 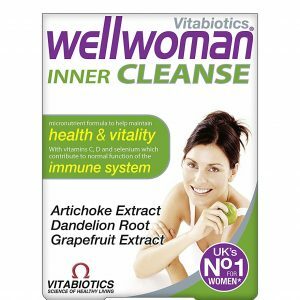 Wellwoman Max helps to safeguard your daily nutritional intake with a wide range of nutrients which give support to the areas of health which are most relevant to women. 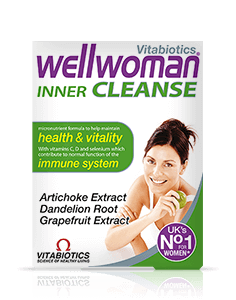 Wellwoman Max is formulated with specific nutrients which have been specifically chosen for their role in supporting all round female health including pantothenic acid which contributes to normal mental performance. It also includes B vitamins: thiamine (vitamin B1), B6 and B12 which contribute to normal energy release, ideal for women who lead hectic lifestyles, juggling work, family and social commitments. Zinc and iron contribute to normal cognitive function. A healthy immune system is important to good health. Vitamin D, folic acid and selenium contribute to the normal function of the immune system. 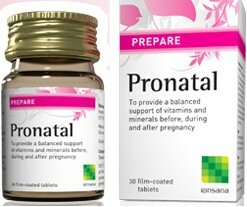 Folic acid also contributes to maternal tissue growth during pregnancy which is important if you’re planning a pregnancy or there’s a chance you might get pregnant. 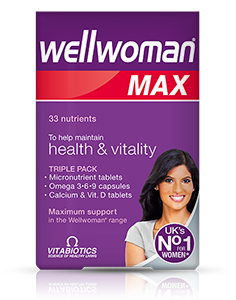 Wellwoman Max includes the exact level of Folic Acid (400mcg) recommended by the Department of Health for women who may conceive, because women of child-bearing age may need this nutritional support before they even know they are pregnant. The formula also includes Co-Q10, Guarana and Green Tea extracts, L-Carnitine and L-Methionine. The Omega-3 fish oil found in Wellwoman Max contains a rich source of DHA (Docosahexaenoic acid) and EPA (Eicosapentaenoic acid). EPA and DHA are classed as essential fatty acids because they cannot be made by the body and must be obtained through the diet. 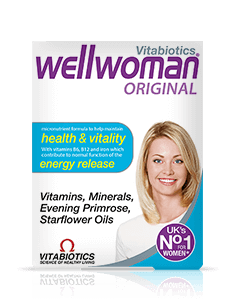 The Omega-3 fish oil used in Vitabiotics’ Wellwoman Max is composed of high quality triglycerides, from sustainable fisheries, sourced from small fatty fish including sardines and anchovies. The fish oil undergoes a rigorous purification process, including molecular distillation and extra filtration stages, to ensure the highest purity oil. Each batch is certified and fully compliant with stringent EC and WHO rules on environmental pollutants, including contaminants such as mercury, dioxins and PCB’s. This means you can be sure of the highest standard. Ensuring an adequate intake of calcium is vital for men and women of all ages, as evidence suggests that healthy practices early in life, including the adequate consumption of calcium and trace elements, contribute to greater bone strength and optimal bone mineralisation. 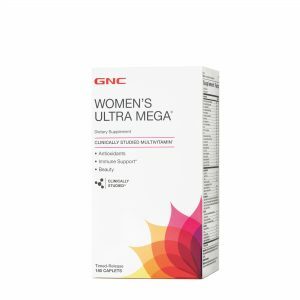 Both men and women lose bone mass during their lifetime but around the time of the menopause, women typically lose bone mass much faster than men, so it is a time when ensuring that you have enough essential calcium in your daily diet is especially important. 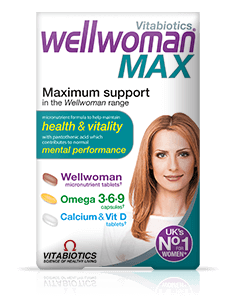 Wellwoman Max contains 500mg calcium. Calcium is needed to maintain normal bones and teeth. Vitamin D is included in the tablet to work in harmony with the calcium: vitamin D contributes to the normal absorption and utilisation of calcium. The UK Department of Health recommends that people aged 65 years and over should take a daily supplement of 10mcg of vitamin D.
Wellwoman Max contains the preferred D3 form of Vitamin D. Vitamin D3, also known as cholecalciferol, is the form of vitamin D that is produced by the skin on exposure to sunlight. D3 is the preferred form of vitamin D because it is the specific form made in the human body and therefore is thought to be more effective than D2 which is found in some supplements.